Three Congress leaders - Ahmed Patel, Jairam Ramesh and Randeep Surjewala - have filed a complaint about the issue with Union Home Minister Rajnath Singh. They have also sent a video. Congress president Rahul Gandhi's visit to Amethi on Thursday led to a controversy with the party claiming that there was a failed assassination attempt. 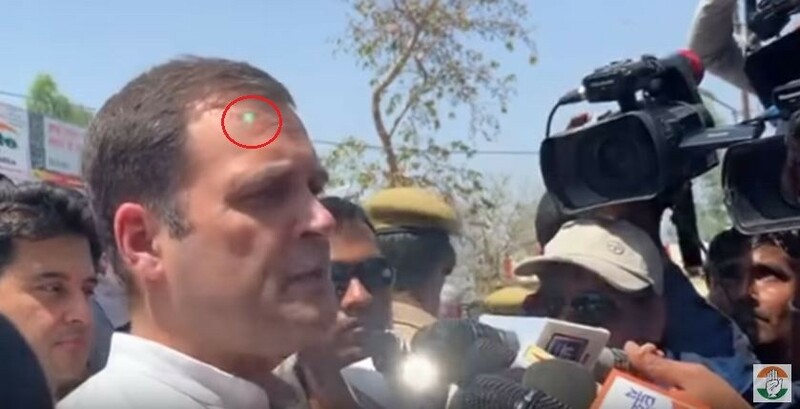 A green laser was spotted on Rahul Gandhi's forehead seven times when he was addressing the media persons in the Lok Sabha constituency. In a statement, the Ministry of Home Affairs said that the green light was from a photographer's mobile phone. "Director SPG informed MHA that the green light shown in clipping was found to be that of a mobile phone used by AICC photographer, who was video graphing the impromptu press interaction of Rahul Gandhi near the collectorate in Amethi," the statement read. In a letter to the Home Minister, the Congress leaders wrote: "Even a possibility like this is a cause of serious alarm and concern pointing towards a breach in the security of Congress President Shri Rahul Gandhi. All of us are deeply shocked and distressed at the possibility of the Congress president being targeted by a potential assassin." "We urge you to immediately take note of this grave and unacceptable security threat as also the security lapse in the security of the Congress president... This is also an alarming lapse on part of the UP administration which is responsible for the peripheral security," they added. The letter also spoke about the assassination of the Congress president's father Rajiv Gandhi and grandmother Indira Gandhi. They added that Rahul Gandhi's security should be the utmost concern and priority of the central government.